We’ve introduced some great new games and new inflatables for 2019. 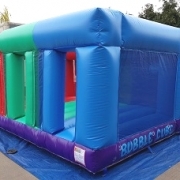 Some of our new inflatables are called The Black Hole, Vegetable Patch, Bubble Cube and Post Boxes. 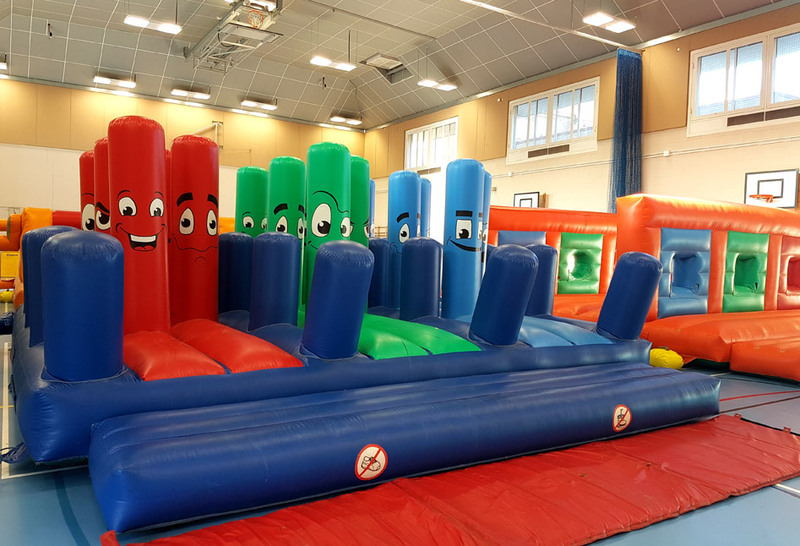 Each year we spruce up our games up with new inflatables, variations and additions to give our many returning clients a fresh feel to our games. The inflatable we’re most excited about is the new Black Hole Inflatable. This totally unique black inflatable is almost completely pitch black inside. We don’t think any other knockout operator has a similar inflatable ! We have the ability to throw a bubble and water mixture into the inside of the inflatable so the teams will be crawling through bubbles in the dark !!!! Our “Post Boxes Inflatable” is new to our Silver Show. This is for a new games called “Picture Postcards” where the team post themselves through the First Class and Second Class post-box holes of the inflatable to collect pieces of a double-sided picture postcard which attach to a Velcro tabard. Our new “Vegetable Patch inflatable” is another new Silver Show inflatable. This inflatable is used on the Strawberries & Cream game. the teams slide and crawl through the wet and bubbly Vegetable Patch inflatable on their way to the end of the course to collect the strawberries to place in the measuring tube. Our Mini Knockout has a new “Bubble Cube Inflatable” (see this blogs top left-hand image). 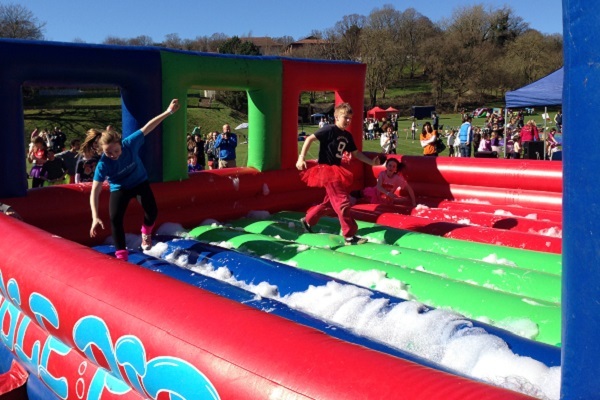 We can’t wait to use these new inflatables and post some images so everyone can see the fun and games on a Knockout Challenge It’s A Knockout! All our new inflatables for 2019 are made in the UK by a UK manufacturer to the BS-EN-14960:2013 standard. They have a current safety certificate issued by an independent tester that can be checked online for clarification. 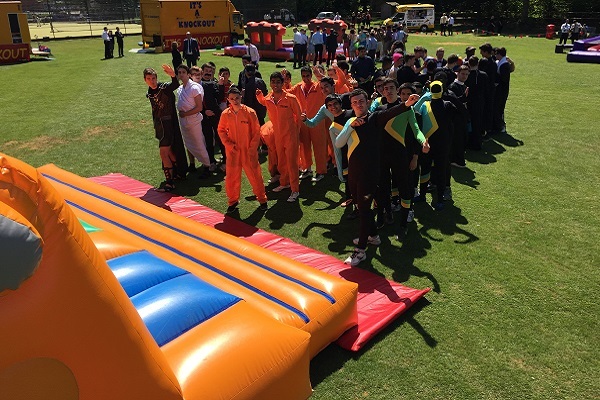 Please also read our blog Bouncy Castle Safety for further details about the responsibility expected of inflatable operators. 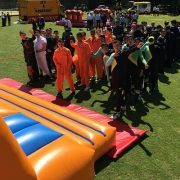 Our Bronze Show It’s A Knockout for 2018 has had some new great new games, inflatables and changes for the 2018 season to make them even more entertaining for the teams taking part and watching audiences. Both the dressing up games on the Bronze Show It’s A Knockout for 2018 have changed. The penguins game has been replaced with a similar style Kangaroo sumo suit one which will help make the game a bit more versatile to different sizes and abilities of teams we encounter at days. The second dressing-up game on the Bronze Show sees the addition of the funny new game “Widow Twanky’s Laundry”. 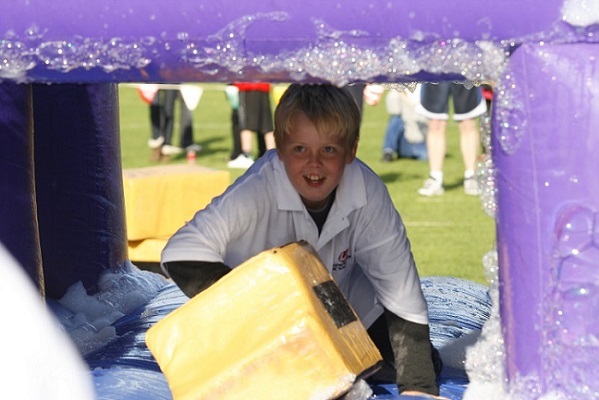 In this game parts of a spotty padded sumo suit are collected through our Mangle inflatable obstacle, these pieces are then assembled together and worn by one of the team members to race back down the course. The Bronze Show It’s A Knockout for 2018 also has a new inflatable slide game “The Flume Slide”, and we’ve moved the Bubble Cave inflatable game over from the Silver Show over which means that four of the seven standard games are different this year, plus with the tweaks to the other games gives the Bronze Show for 2018 has a fresh new feel for the many people, charities and organisations who come back to book our games year-on-year. All these changes make our Bronze Show It’s A knockout ideal for charities and organisations using our games for their fundraising ventures. 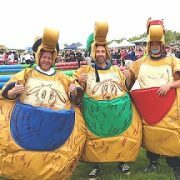 the Bronze Show is a great introduction step onto the It’s A knockout fundraising ladder for those who have not ran an It’s A Knockout day before. Please Contact Us if you’re new to Knockout and we’ll talk you through everything you need to know. 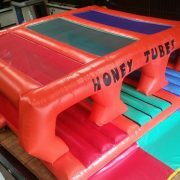 You can also find other Blog articles about how our Knockout’s can be used for fundraising events.